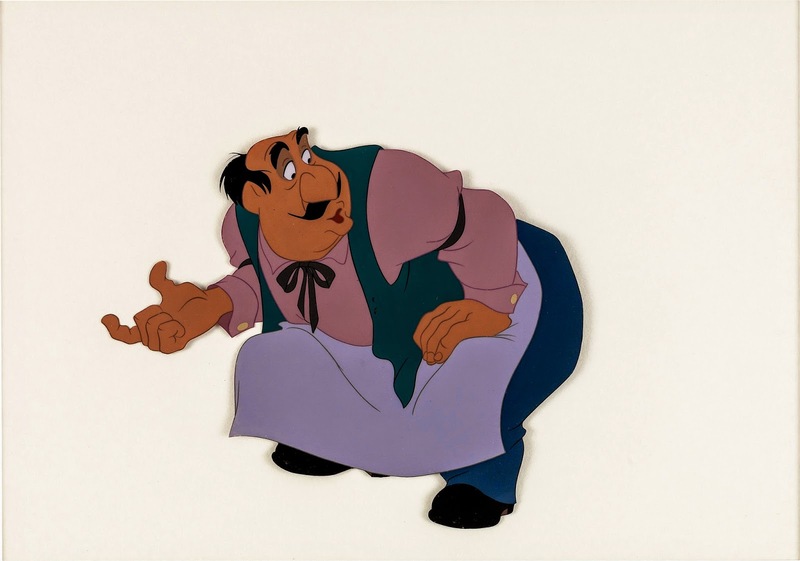 Disney’s ink and paint artists were in a class by themselves. The control the inkers had over super thin, colored lines, put down on clear acetate sheets, was breathtaking. And they were wearing gloves while doing this, any fingerprint on a cel would show up on the screen. Just like animators, they had weekly quotas, cels had to be traced off the clean up drawings in a timely manner. 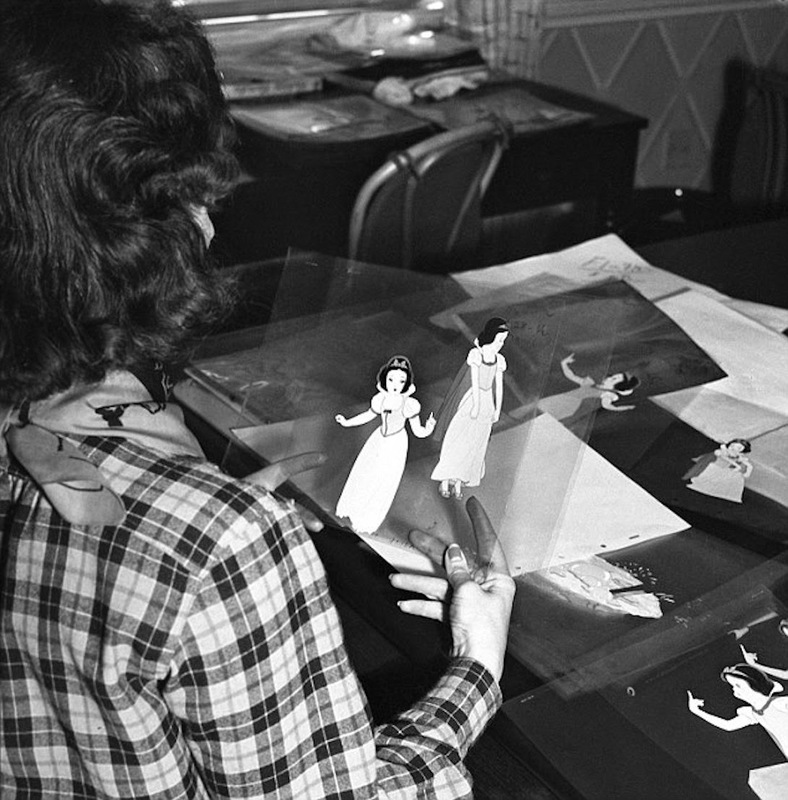 The required accuracy to maintain all subtleties from the drawings on to cels was incredibly demanding. Just imagine having to trace Wendy’s face. You are ever so slightly off with her facial features, and the character ends up looking like ET. 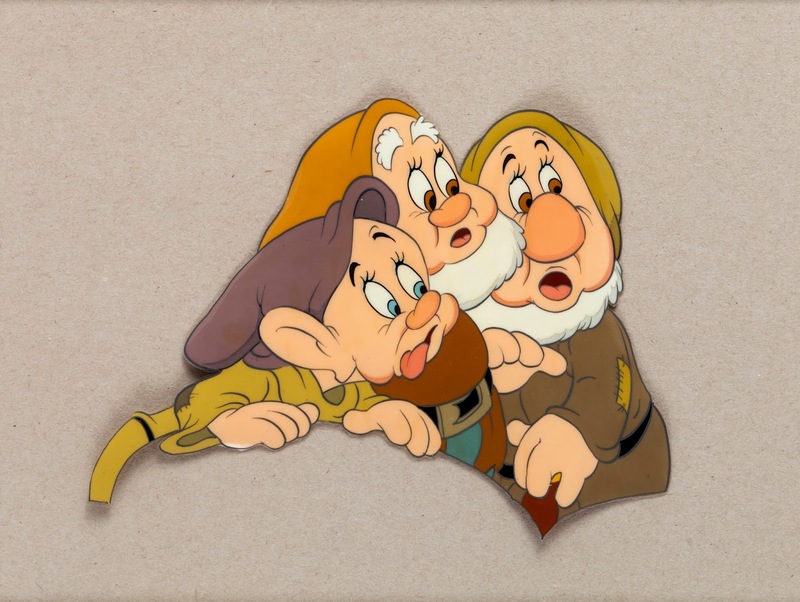 Walt Disney did complain when final scenes of Snow White didn’t show that perfect consistency, her eyes, nose and mouth seem to float a little from time to time. After all, this was the first realistic character ever done at the studio, and reaching a level of perfection took a learning curve. By the time Disney produced Sleeping Beauty the inking had gotten so tight and flawless, there isn’t one bad cel of Aurora in the film. 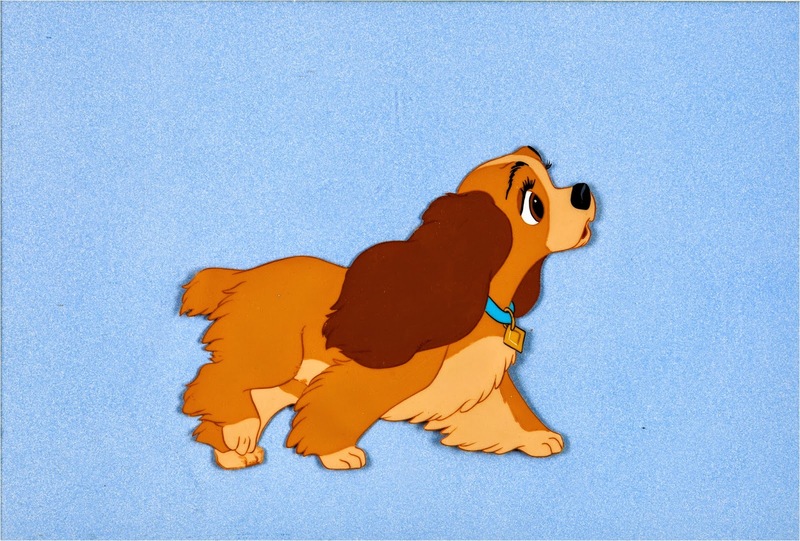 Here are just a few examples of the art of Disney’s Ink & Paint department. 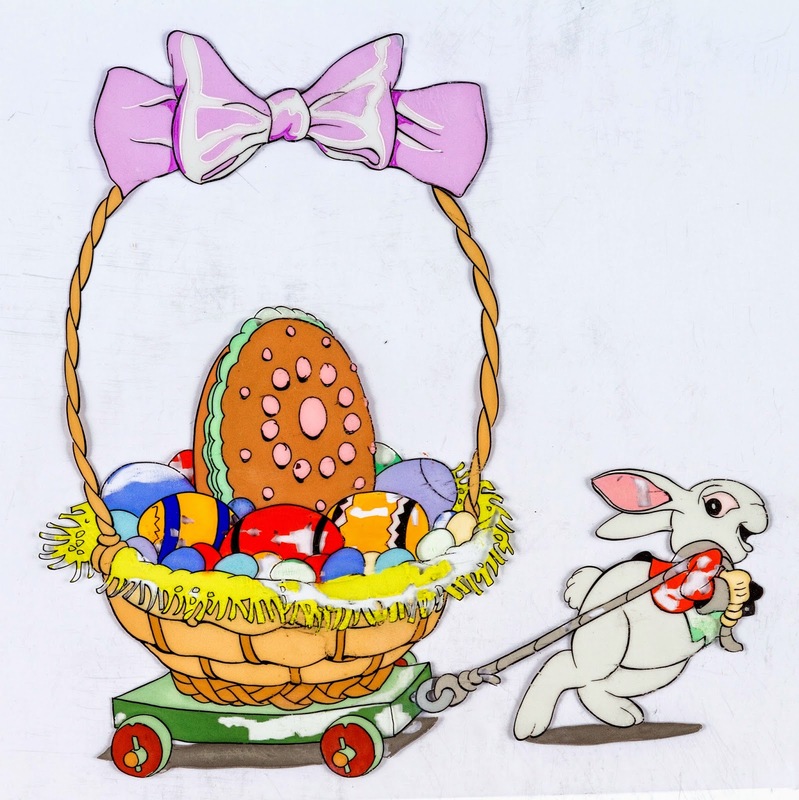 This cel from the 1934 Silly Symphony Funny Little Bunnies shows its age. Some of the paint has come off, but look at the amount of work involved in this one image. There is a ton of line mileage on that easter basket, and an endless assortment of colors. 12 - 24 cels per second, its mind boggling. 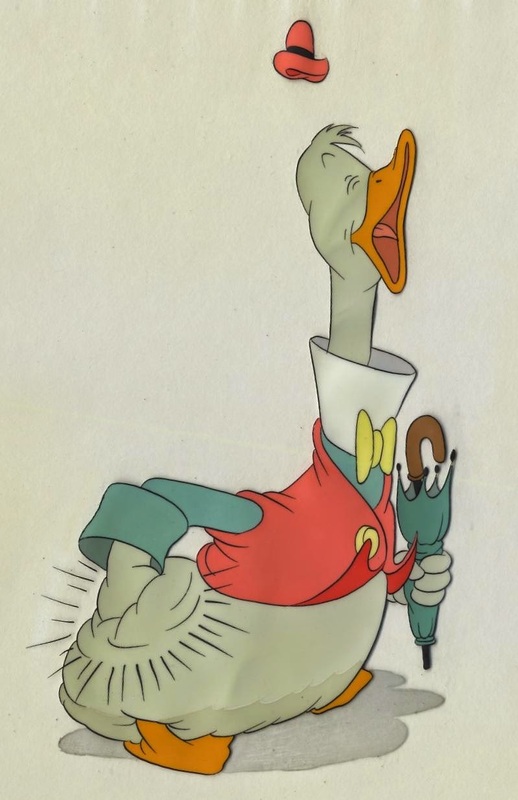 Donald’s Cousin Gus from 1939. The ink line is mostly dark grey except for the indication of the darker underbelly. What a beautiful color scheme. Dark grey for the Dwarfs as well, but black for the eyes and again different colors for the shadowy areas. 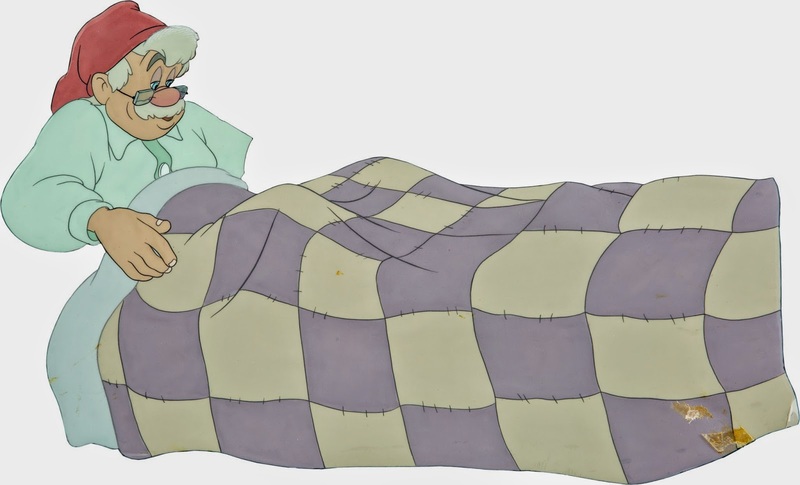 Multiple color ink lines on Geppetto and his blanket. And the top of his hair gets a dry brush highlight. Check out the effect his glasses have on his face, slightly darker colors. 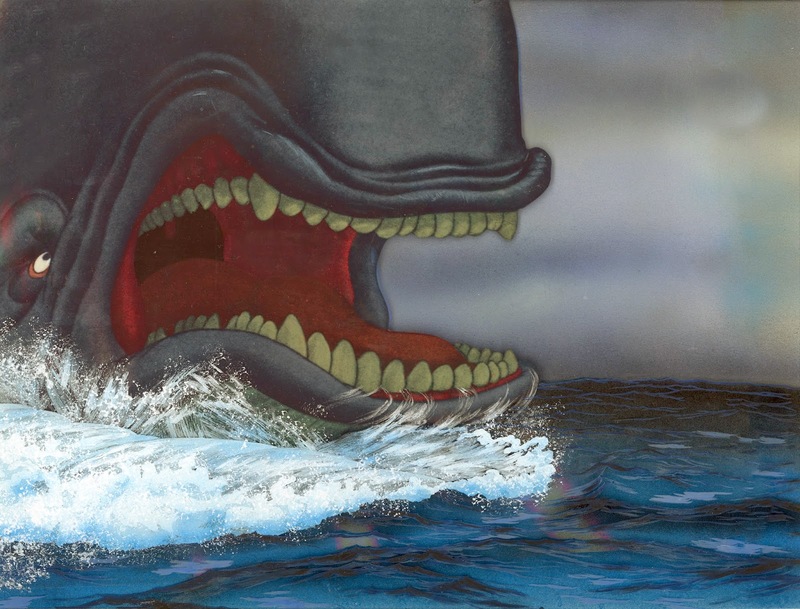 If you really want to find out how all the shading was done on Monstro, the whale, you need to look up John Canemaker’s new fabulous book, “The Lost Notebook-Herman Schultheiss and the Secrets of Walt Disney’s Movie Magic”. Milt Kahl recalled an issue the inkers had on Bambi. It seemed impossible to keep the width of the deers’ legs consistent. 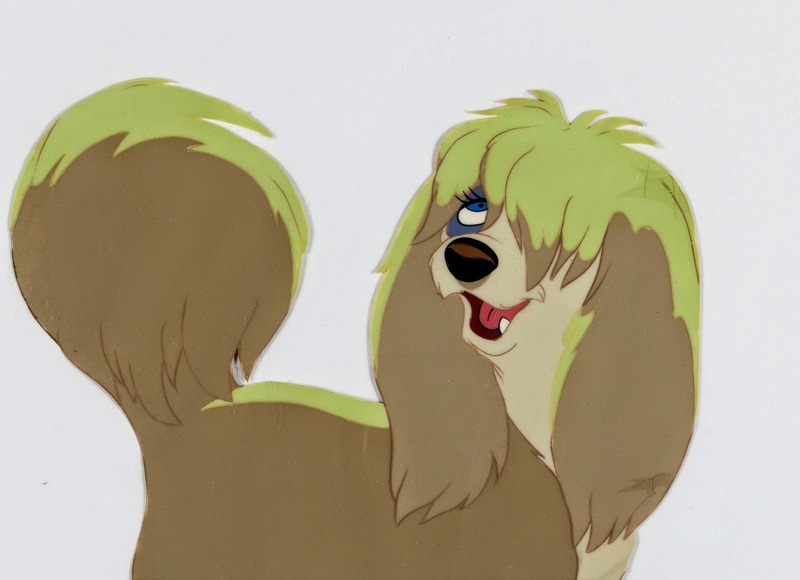 Each cel had a certain thickness, and if you put down ink lines as you moved your head from side to side, the placement of the lines would vary, and those legs ended up looking a little thicker or thinner from one cel to the other. To avoid this from happening, the inkers actually in-betweened subtle leg motion on cels, without referring to the paper drawings. 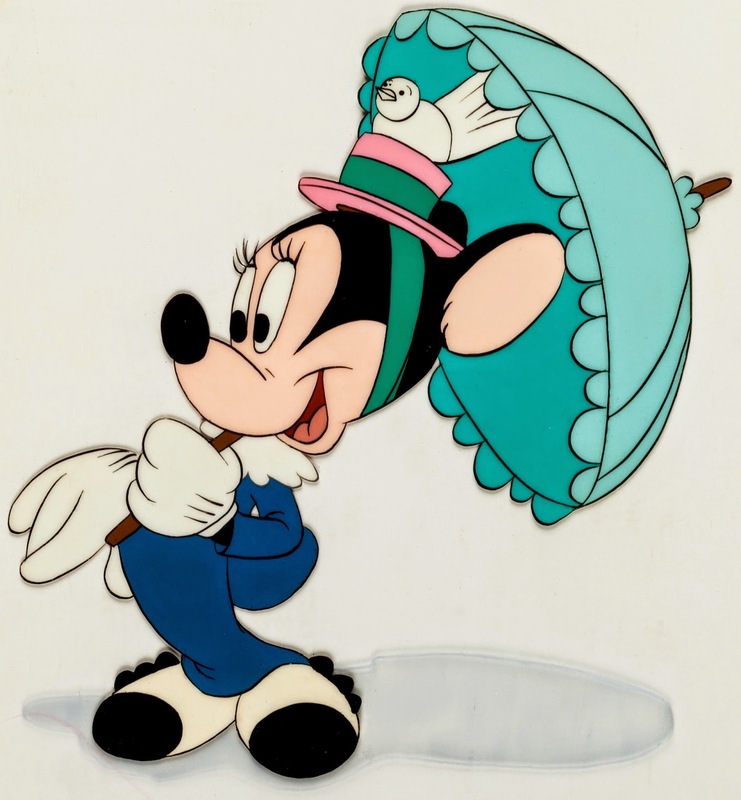 Less critical inking was required for cartoony characters like Minnie Mouse, here on a cel from the short The Nifty Nineties, 1941. Alice’s cat Dinah is painted in warm orange/brown colors. For contrast her turquoise eyes sure pop. Yellow reflections in her pupils, making the eyes look wet. 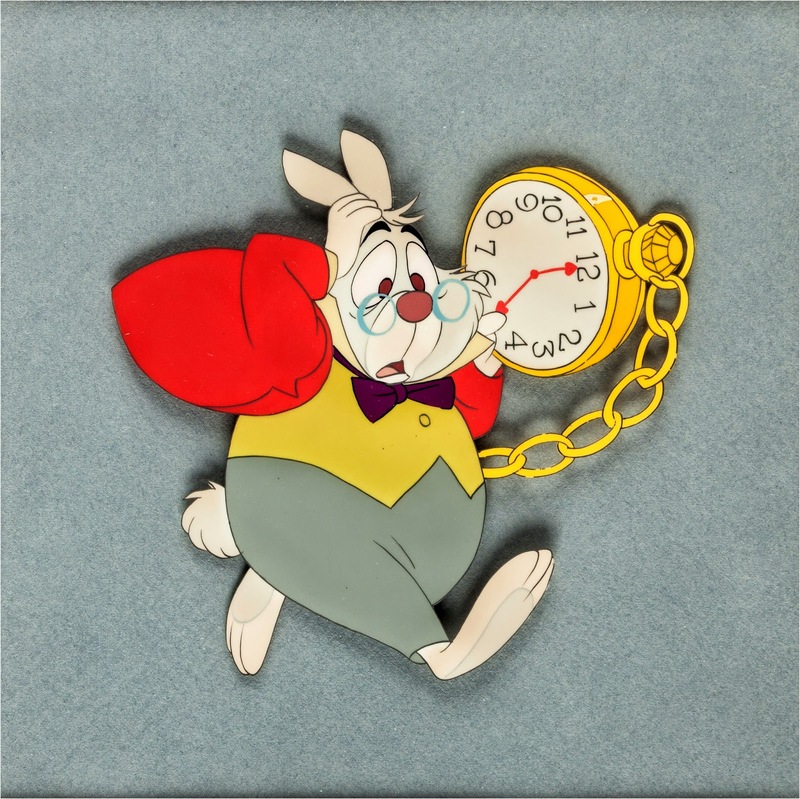 The White Rabbit is being late as usual, running around with 24 frames per second. This of course means that the watch with all its details needed to be accurately inked that many times as well. The Walrus is about to enjoy the Oysters. Some of the inking has come off, nothing a good restorer couldn’t fix. 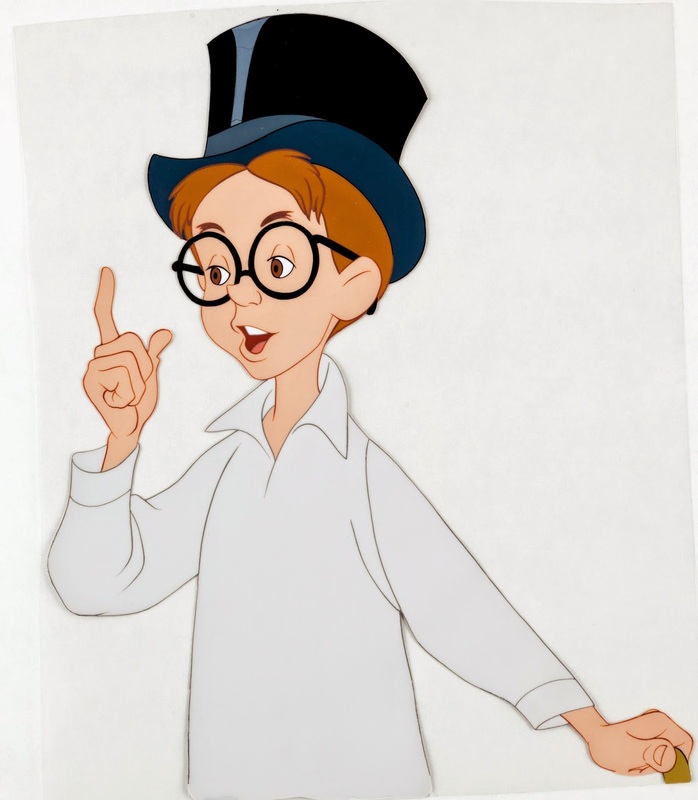 A nice cel of John from Peter Pan. Notice how his eyelids show a subtle thickness, something that can get lost in the process of redrawing and tracing. Definitely from a Kahl scene. 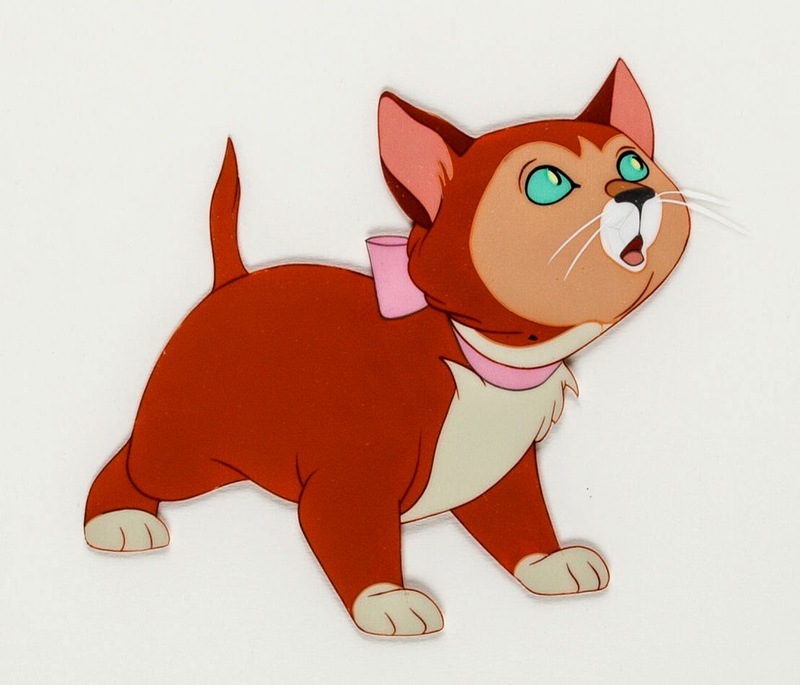 Just gorgeous colors on this cel of Tiger Lily. Lots of detail on her dress, that pattern around her shoulders would be very tricky to keep consistant. What a smart choice to have Lady’s fur break up on her body’s underside and the back of her legs. If the fur would break up everywhere she’d look like an uncombed poodle. There is that nice thickness again on her eyelids. Adds so much dimension. The center of her neckless has two inked colors, giving it some depth. Tony is painted in night colors. The dark areas around his eyes are defined by neutral ink lines. I was once complementing Eric Larson on the effective use of light on Peg’s body. He told me that he had nothing to do with that, an effects assistant was responsible for it. But look at how much more inking that involved. 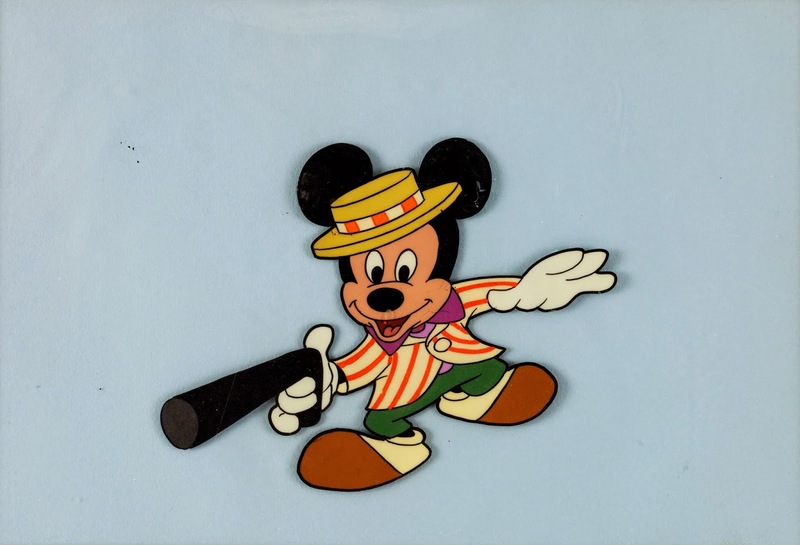 A cel from an Ollie Johnston scene, featuring Mickey announcing the Mickey Mouse Club. In an effort to make the character read best on a TV screen, all exterior ink lines were thicker than the interior ones. 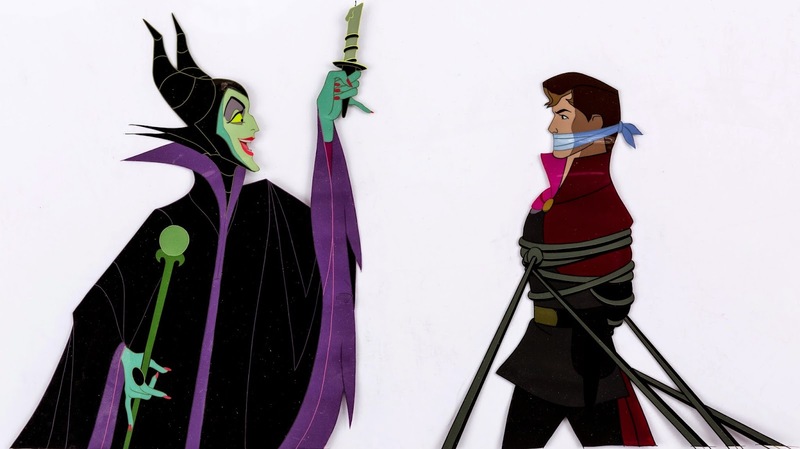 An amazing cel of Maleficent confronting Prince Phillip. Every ink line is rock solid, bringing out the stylized character design. To show the candle’s glow, the faces had to be painted in a lighter color. I couldn’t ink like this if my life depended on it. 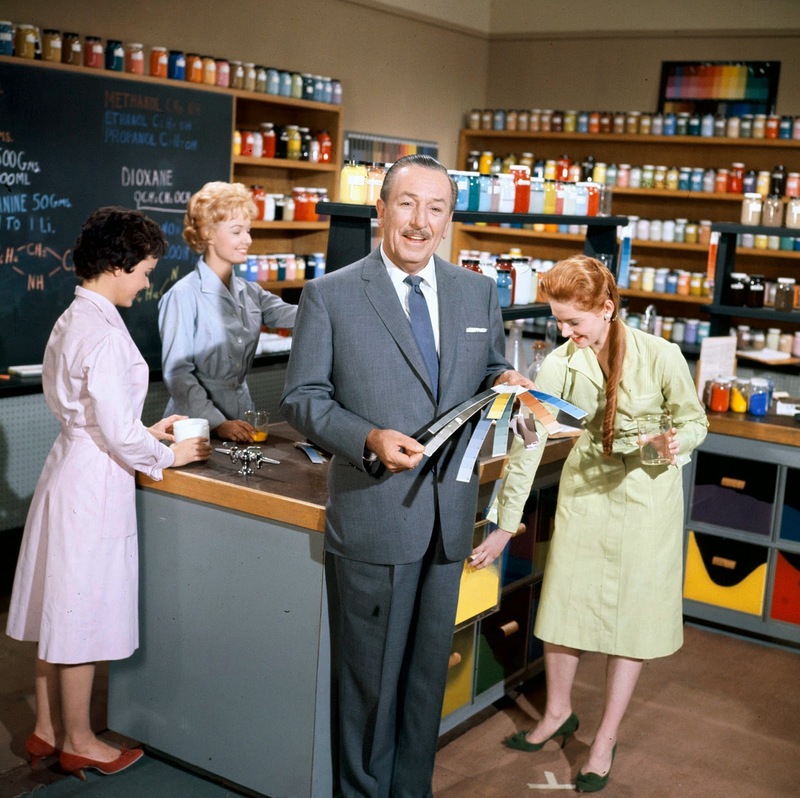 Walt Disney visits the ink and paint department during a TV program, where the topic was color. The three ladies are probably actresses, but I am not sure. The still camera aimed a little low, revealing a taped cue mark on the floor. I remember visiting the ink and paint building myself way back. There were plenty of painters working on the films of the early 1980s, but only a few inkers. The Xerox process had replaced most of the inking. Only occasional inking was required for things like lips and eyelashes on human characters. 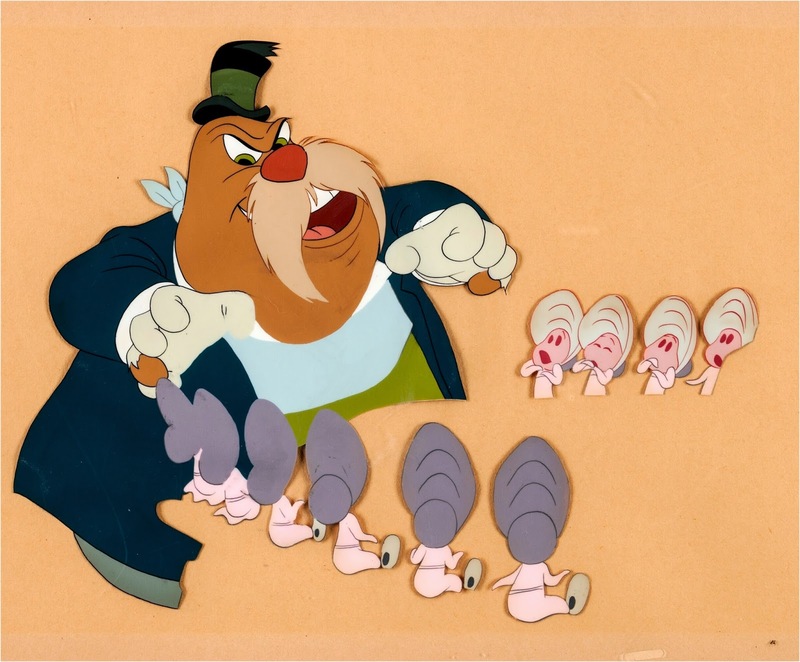 The Little Mermaid turned out to be the last Disney feature to be painted on cels, after that digital ink and paint took over.